3/8" x 24 UNF Single Banjo bolt switch. FOR DOUBLE BOLT VERSION AND FOR OTHER THREAD SIZES. A great option to replace a faulty OE switch Too! These can be used in the front or rear line. Up to 2004 Single disc models use 3/8x24 on the Caliper and 7/16x24 at the master cylinder. 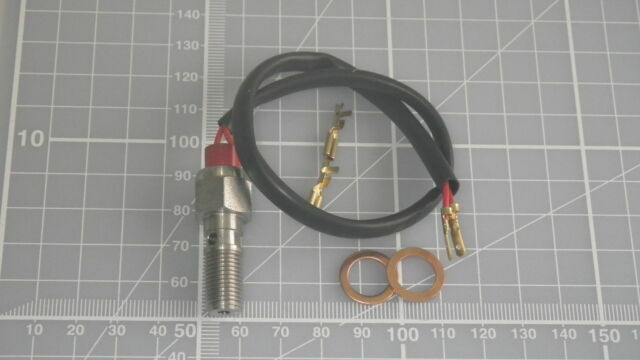 Having bought braided hoses for my Dyna Convertible it was a surprise that there was no banjo for the brake switch. My hose supplier told me what I'd need and this one fit the job perfectly. It arrived very quickly, well packaged and was on the bike in no time. Just what I needed!